Ghostweather R&D Blog: Fate Mag Online: Browse the Weirdness! 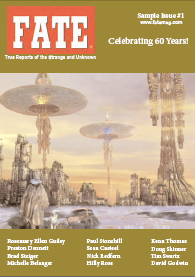 Fate Magazine ("True Reports of the Strange and Unknown") has a sample issue up online (it's a big but fast loading PDF). I went in to look at the werewolf folklore article, but ended up reading most of it, because it's just so fun. But what made me LOL was the classifieds: Amid sections called "Magick," "Earth Mysteries," "Ghosts," "Occult," "Pyramids," "Voodoo," etc, they still manage to need a section called "Miscellaneous." Equally entertaining are the ads for books and services, sprinkled throughout. I don't mean to mock too hard, though; I really did enjoy it, and considered getting myself and a relative subscriptions.